Around four billion years ago, the Moon had a magnetic field that was about as strong as Earth's magnetic field is today. How the Moon, with a much smaller core than Earth's, could have had such a strong magnetic field has been an unsolved problem in the history of the Moon's evolution. Scientist Aaron Scheinberg of Princeton, with Krista Soderlund from the University of Texas Institute for Geophysics, and Linda Elkins-Tanton of Arizona State University, set out to determine what may have powered this early lunar magnetic field. Their results and a new model for how this may have happened, have been recently published in Earth and Planetary Science Letters. Earth's magnetic field protects our planet by deflecting most of the solar wind, whose charged particles would otherwise strip away the ozone layer that protects the Earth from harmful ultraviolet radiation. While Earth's magnetic field is generated by the motions of its convecting liquid metal outer core, known as the dynamo, the Moon's core is too small to have produced a magnetic field of that magnitude. So, the research team proposed a new model for how the magnetic field could have reached Earth-like levels. In this scenario, the dynamo is powered not by the Moon's small metal core, but by a heavy layer of molten (liquid) rock that sits on top of it. In this proposed model, the bottom-most layer of the Moon's mantle melts to form a metal-rich "basal magma ocean" that sits on top of the Moon's metal core. Convection in this layer then drives the dynamo, creating a magnetic field. 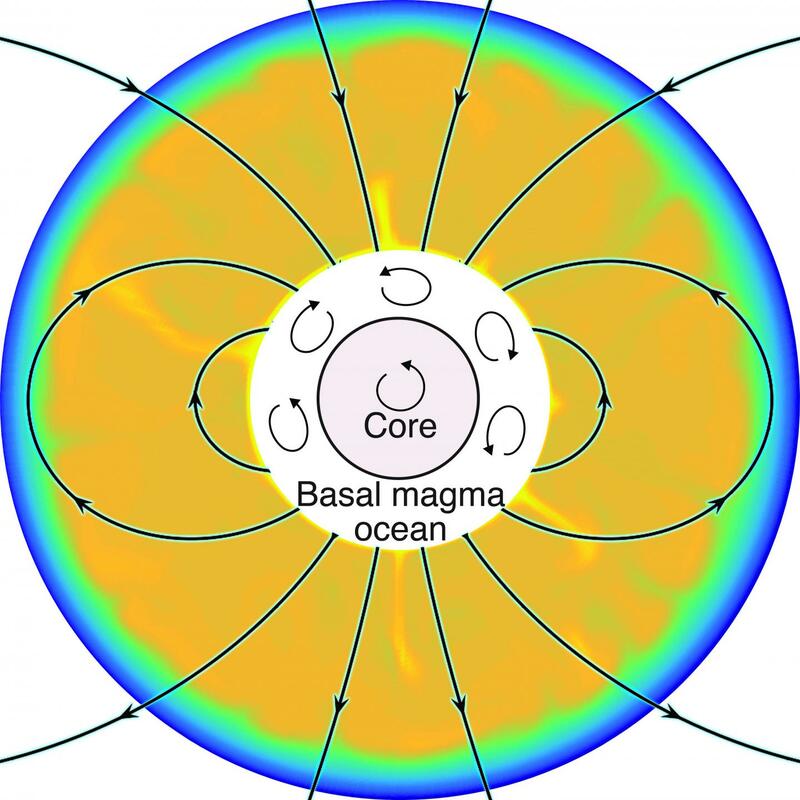 "The idea of a basal magma ocean dynamo had been proposed for the early Earth's magnetic field, and we realized that this mechanism may also be important for the Moon," says co-author Soderlund. Soderlund further explains that a partially molten layer is thought to still exist at the base of the lunar mantle today. "A strong magnetic field is easier to achieve at the Moon's surface if the dynamo operated in the mantle rather than in the core," she says, "because magnetic field strength decreases rapidly the farther away it is from the dynamo region." In simulations of the core dynamo of the Moon conducted by the team, they kept finding that the lower layer of the Moon's mantle was overheating and melting. Initially, they tried to focus on cases without melting that were easier to model, but eventually considered that the melting process was the key to their new model. "Once we started thinking of that melting as a feature, instead of a bug," says Scheinberg, "the pieces started fitting together and we wondered if the melting that we saw in the models could produce a metal-rich magma ocean to power the strong early field." Further along in the evolution of the Moon (around 3.56 billion years ago), there is also evidence that the strong magnetic field that existed around the Moon eventually became a weak magnetic field, one that continued until relatively recently. The team's new model may also help explain this phenomenon as well. "Our model provides an elegant potential solution," says Scheinberg. "As the Moon cooled, the magma ocean would have solidified, while the core dynamo would have continued to create the later weak field." "We're excited by this result because it explains fundamental observations about the Moon — its early, strong magnetic field and its subsequent weakening and then disappearance — using first-order processes already supported by other observations," adds co-author Elkins-Tanton. Beyond providing a new model to build from, this research may also provide a better understanding of planetary magnetic field generation elsewhere in our solar system and beyond. "Basal magma ocean dynamos, like the one in our model, may well have been a common occurrence in rocky planets like Earth and Mars," says Scheinberg.